Snake venom is produced by glands below the eye (the mandibular gland) and delivered to the victim through tubular or channeled fangs. 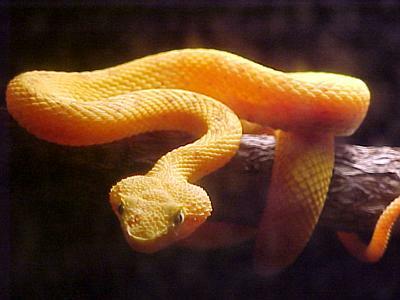 Snake venoms contain a variety of toxins and neurotoxins, which disable signalling in the nervous system. Snakes use their venom principally for hunting, though they do not hesitate to employ it defensively. Venomous snake bites may cause a variety of symptoms, including pain, swelling, tissue necrosis, low blood pressure, convulsions, hemorrhage (varying by species of snake), respiratory paralysis, kidney failure, coma and death. Doctors treat victims of a venomous bite with antivenom, which is created by dosing an animal such as a sheep or horse with a small amount of the targeted venom. This causes the immune system of the subject animal to respond, producing antibodies to the venom; the antibodies can then be harvested and injected into bite victims to treat envenomation. Here you may post messages or questions pertaining to all aspects and issues regarding the keeping, breeding, health, and conservation of Venomous Reptiles.